When Delta Tau Delta members visit Muncie, Indiana for their Northern Division Conference this weekend, they will be among the first guests to see a business model in action improving the quality of life for citizens of Muncie and beyond. 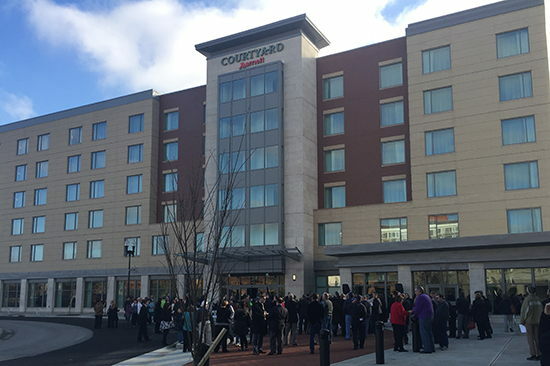 The Fraternity is the first major conference to book at the brand new state-of-the-art Courtyard Muncie at the Horizon Convention Center, which opened last month. The facility is much more than a typical conference center and hotel; it is a first-of-its-kind teaching facility providing opportunities for people with disabilities. Through the Erskine Green Training Institute, the hotel offers a postsecondary education program with vocational training in the hospitality, food served and health care fields. The program also focuses on helping its students learn soft skills such as resume development, interview skills, communication and using public transportation and independent living. The collaboration was driven by Muncie native Jeff Huffman, who saw a void in opportunities for his own son and others with disabilities. Huffman served on the board of Arc of Indiana, a statewide advocacy group committed to people with intellectual and developmental disabilities. As Arc worked through an exercise on change management in 2010, it developed a plan called The Blueprint for Change. This transformational program empowers people to shape their future, nurture and create natural systems of support and strengthen the foundation of programs and services for people with intellectual and developmental disabilities and their families. To help individuals move from dependency on government assistance to being more fully functioning members of society, Huffman saw opportunity in a vacant hotel across from the convention center and began asking how that hotel could be turned into a training center to grow employment opportunities. Although the vacant hotel property was already on the path to becoming senior housing, the idea of such a training center kept taking shape. Kim Dodson, associate executive director for Arc of Indiana, brought Jeff Huffman into conversations with Muncie Mayor Dennis Tyler and they begin looking for opportunities to build a new hotel. Fast forward to 2016 and the brand new hotel property is up and running. The new Courtyard Muncie is owned by the Arc’s for-profit corporation, Arc Innovations. At least, twenty percent of the hotel and restaurant’s employees are people with disabilities—a segment of the population that typically has an 82 percent unemployment rate. “The new hotel is a game changer for us,” McKinney said as she talked about new opportunities to market Muncie’s downtown hospitality corridor which includes the hotel and parking garage, amphitheater, several restaurants including Thr3e Wise Men Brewing Co., and entertainment all in a two-block corridor. An enclosed walkway even connects the hotel and convention center. This weekend the Fraternity expects 350 students and 50 alumni from Indiana, Illinois, Michigan, Ohio, North Dakota, Minnesota and Wisconsin to gather to exchange ideas and learn leadership strategies and techniques to become better officers and members. As Fraternity men, they have accepted a special responsibility to serve society. Strengthening a community while conducting business fits well with its mission. “Just by coming to this hotel you are supporting a community,” McKinney said. Delta Tau Delta is a values-driven fraternity founded in 1858. Its mission, “Committed to Lives of Excellence,” is what the Fraternity seeks to represent at its host institutions. Delta Tau Delta strives to develop its members’ leadership skills, seeks superior academic achievement, promotes community service efforts, and helps its members launch successful careers. Delta Tau Delta has 139 chapters and colonies across the United States with a membership of more than 9,500 undergraduates and 119,000 alumni members. The Fraternity posts a GPA of 3.09, making it one of the highest achieving men’s fraternities in academics. The Fraternity has five chapters in Indiana (Ball State University, Butler University, DePauw University, Purdue University and Indiana University), with a sixth starting at Wabash College this winter. The Ball State Chapter in Muncie will celebrate its’ fiftieth anniversary this fall.